As I move north, I’m noticing some autumn colors in the trees–when there are trees. North Dakota was a little sparse, as was a lot of Manitoba. Half of Wisconsin was sparse, and half was this beautiful, hilly, tree-y area with rock upcroppings(? ); that was where I first noticed some color change in the trees. Part of my drive yesterday seemed to be moving into some hills and tree-covered areas, as well, so I’m pretty excited to see what today holds. I’m a smidge further south than I’d originally anticipated (I did ponder driving through Regina–locals seem to pronounce this with a hard “i”–but decided against … and the GPS decided for, so that’s where I’ll be this afternoon–I’m hoping to make Saskatoon today, which will put me right on schedule). 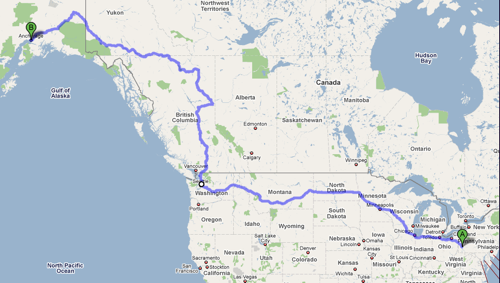 I was going to try to go a little further per day to get into Anchorage by Friday, to sign the lease on my apartment. But I just don’t think it can be done. There’s little enough between stops that, unless I want to sleep in the car, I’m kind of going to have to go with these locations and mileages. It sounds like the woman at the rental company might be willing to meet me on Saturday. So, fingers crossed, there. Also, that puts me in town in time for the last farmer’s market of the season! The other thing that occurred to me, while I was driving, that I meant to mention, was that maybe this is the right way to do this move. I think a flight and, bam, I’m in Anchorage… that might be a little too sudden. This really gives me time to think and transition and absorb the change. Also, I’m on the road all day and too tired when I get to the hotel to really be doing much, with respect to the library world. It’s a good break. I do wish I had a travel companion. The birds are by turns wonderful/adorable and miserable/screamy, much like a travel companion might be. But they aren’t interested in my snark about Minnesota drivers (seriously, people, you have all this space out here–use it and don’t merge in front of me and then slow down! ), and they don’t tell me jokes or sing along with musicals with me. (If the government has a monitoring device in my vehicle–there’s no reason to believe they do, except that it’s funny–I pity the fool who has to listen to it. All of Dr. Horrible is more or less sung in my range, but some of the other things I like singing along with aren’t.) I could make better time with another driver, as well, obviously. Anyway, didn’t mean to end on a complainy note. Really, the trip’s been going well. I’m tired, but holding up. I like Comfort Inn a lot. Motel 6 is also fine–the one in Fargo seemed like some sort of weird dorm, in some ways–though I wish they had wifi. Super 8 is my least favorite, just because that one branch was built out of cardboard; I’d give them another chance, figuring that can’t always be the case. But, yeah, I’ve been sleeping OK. The birds are holding up all right. (They get really grumpy after about 4pm, on the road. But so do I, so that’s OK.) Like I said, beautiful weather. So, you know, things are good. Also, I’m far enough north that all the motel parking spots have electrical outlets. So, here I am, in Brandon, Manitoba. The GPS disagrees with Google Maps on big decisions, and I don’t know why. It wanted me to drive back down I-29 and get on I-94, this morning. (Since I’d already wasted a bunch of time driving past Fargo–it did not impress me–and then driving back, when I learned that there aren’t motels between Fargo and Grand Forks, I was disinclined to acquiesce to its suggestion. Also, I wanted to get out of the US before the holiday traffic started.) Now, it has me taking 1 all the way across Canada, rather than going the faster way to Saskatoon, then hopping on 1 (aka the Trans-Canada Highway). I didn’t really notice until I was committed to the route. So, there you go, I guess I’m taking the south road. Things have been going OK, mostly. Some bloopers: The GPS thing. The motel-search thing. Grace broke a blood feather, and it bled (just a little) two nights… pretty much up until I bought styptic powder, which I have not yet (knock on wood) applied. The other night I got a beer with one of my Madison friends at BW3 (does anyone know where the third W comes from?) and had a hard time walking straight–who knew “pint” was not the standard size? Today, I drove away from a gas station with my fuel thing open; I heard it making noise and realized it just before a car full of guys–who seemed friendly and hippie-ish–passed me and indicated it. I think they saw the tail end of a curse word–one of the obvious ones–because they moved from pointing helpfully to laughing sympathetically, then drove off. Also, we could solve the continent’s power problems by installing wind generators along the Trans-Canada Highway in Manitoba. Seriously, the cross-winds were terrible. Are terrible, always, I suspect. And the non-highwayness of it is very strange, to me. There are traffic lights, which isn’t so strange after life in northern Virginia, but there are these weird cross-roads where people have to speed across the highway… two of those people, right in front of me, were tractor trailers; I had to pretty much stop, to keep from hitting them. All over ND and MB, it’s super flat, and it’s hard not to get distracted by the antennas when I see them–they’re huge, and they must have awesome coverage. (No, seriously, it seems like Canada has taller antennas.) Which is to say, I had to correct so as not to drive off the road, one or two times, so now I try not to look at them. I found a fruit stand! I can’t get the photo off my phone, because Canada is apparently a “roaming” area for Verizon (not just “extended network”). Eventually, I will. It’s notable because there were none between Pennsylvania and Manitoba! I had this fantastic Wisconsin cheese and some Triscuits, but no tasty fruit to go with them. The first couple stands in MB had signs that said “turn now,” rather than “turn in 3km”; the people who planned well made the sale! (Maybe I will spin this into a library-themed post, at some point in the future.) Other photos I promise: a field of sunflowers (out the side window), some kind of giant grain-processing thing (out the side window … taken because man are those things huge! ), a poor picture of the Budweiser plant, and probably some other things. I didn’t get any photos of it, but the soil in North Dakota is this weird blackish brown. The Canadian border crossing was painless. I had to park and go into the office, but nobody wanted to see the birds or make me fill out a form or anything. They just wanted to see the health certificates and have me wait five minutes, and then I was on my way. Two days without being able to really post–I know more happened. But I’m super sleepy and kind of distracted. I’ll share my pictures, and that’ll be the end of today’s post. I’ll do what I can to find Internet-enabled accommodations tomorrow, as well, since the phone’s spazzy. There’s the car, packed. There’s Grace, in front of the Pittsburgh skyline from 279. There’s a truck being dragged, so that it faces like it’s driving toward you, which terrifies me. There’s the Chicago skyline from … maybe too far away to see it well. And there’s a mobile chapel, which I found rather strange (note the antenna … whoa). My Twitter stream has a picture of me in front of the Wisconsin sign (Dale’s right–it was an awful picture of me) and a picture of a car dragging a big cheeseburger and ice cream cone, which seemed odd. Distance: 329.2 miles (from the gas station in Pittsburgh). George has also passed the thousand-mile mark. And made slightly above her rated highway miles-per-gallon pretty much the whole time, which is awesome, considering that she’s loaded down! Not much else to report. I went further than I’d planned–into Indiana, instead of stopping on the Ohio border. I didn’t sleep a lot last night, so I sort of had to stop when I did, to stay safe. No sense in worrying about trying to get ahead of schedule, yet: tomorrow’s stopping point is set. (Safety note: I wouldn’t have gone further today even if that weren’t the case!) I have a couple of pictures, but they have to stay on my phone until I get to a better place to send them–this motel blocks Verizon’s wireless, it seems. (Besides, Gmail’s down.) Dale has the “real camera,” so all of my pictures will be taken with the phone, until I find myself at a Costco, to pick up a new camera. The birds did great. The plants seem a little wilted. I’m dehydrated, but will be having some water before I sleep tonight. Playlist (roughly in order for today–and I probably won’t keep track every day): Eve 6 (great roadtrip-starting music), Dr. Horrible, Once More With Feeling (the Buffy musical :)), 2 Girl Talk albums, Repo: The Genetic Opera, Dr. Horrible, a little KT Tunstall, and a little iPod randomization. As far as the car goes, there is apparently a long line at the finance office at the Subaru dealer, but I’m really, really crossing my fingers that that’ll work out. I trust Grover to carry me, more or less; I don’t trust Grover to carry me and my three birds. The decision of what to drive isn’t made, yet, but the decision of how to drive is almost entirely separate, anyway. I can start thinking about that in parallel. 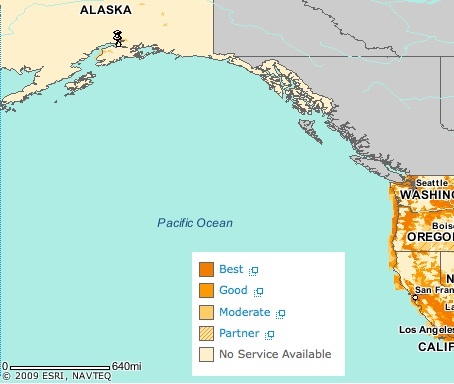 The second, going through Seattle (an option I’m considering largely due to the convenience of using US currency and staying in hotel chains I know are pet-friendly for as much of the way as possible), is 4902 miles long. That’s 13 days. I’d like to take a day or two, in there, to chill, be a tourist, and not really drive anywhere (so, 13 and 15 days, respectively). Where and whether I can depends, a bit, on which path I take, of course. There’s a third option: ferry from Bellingham, which is north of Seattle. As far as I can tell, this is a terrible idea–it’s expensive, takes possibly longer than driving, and … actually, if the trip planner is to be believed, it’s not even possible, unless I leave earlier or drive faster. And the birds would have to stay in the car. The whole time. … No way. One other possible wrench in this plan is, if my newest Ravelry friend is to be believed, the possibility of snow along the Alaska Highway. Now, looking at historical data for the Yukon, it seems like snow in mid-September is not really a problem. A kind professor tipped me off to the existence of the Milepost, a sort of travel guide for the Alaska Highway–which looks like it stretches into the Yukon, as well–and I don’t see a lot of evidence that snow is of great concern. … I think I may ask an Alaskan librarian for help with this. I know a couple, now, and it’s an excuse to get to know a couple more, right? If I don’t hate driving by the time I hit Tok, I may go up to Fairbanks and down through Denali. 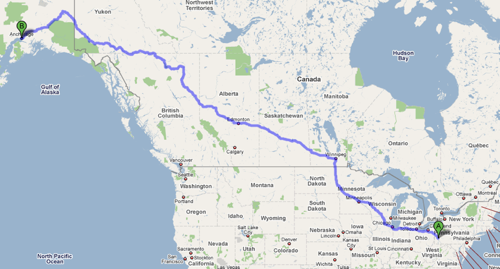 That would be an awesome drive. Also, this whole thing could be done more efficiently–and would be a whole lot more fun–if someone were able to join me for any leg of the trip. I realize flying back to Pittsburgh from Anchorage is expensive–believe me–but maybe someone wants to go to Wisconsin? Or from Wisconsin to Dawson Creek, BC? … No worries, if not. I’m prepared to do the drive myself, but I figure it can’t hurt to ask. Last, but not least, I have put in requests for bids from pet shipping companies, for the birds. I don’t think we’re going to deem that especially economical, but who can say? As always, feel free to leave comments/advice/complaints/suggestions/recipes/lolcats.